In the year 1938, when Russia was paralyzed by Stalinist terror, a small state archives in Moscow received an old book called Revelation of Fire or Cenergite manuscript that had in earlier days been kept secret in a monastery for a long time. Many years later, a Dutch slavist and a Russian female archivist discover that Cenergite manuscript has disappeared. They try to find out the hidden meaning of that incident. In addition, they start reconstructing the history of the manuscript and the many changes in its ownership over the past 200 years. Many surprising or strange events happened surrounding Cenergite manuscript. The best-laid schemes regularly come to nought, the best of intentions turn out disastrously, the worthy fail to receive their just deserts, and evil, in the long run, brings forth good. The action is played out in the most notable periods of Russian history: in the 1870’s, for example, in the Civil War of 1919; in the period of Stalin terror; in the Brezhnev years and finally in the contemporary world. The novel is characterized by variety of scenes and epochs, high dramatic tension, and by its remarkable characters, many of whom are women. "The idea of the novel connects with my personal experience. I studied the history of Russian literature in the University of Moscow and could not share the official statement declaring our culture in the Middle Ages as a great one. In reality the old Russian literature has not so many original writers and extraordinary books. Personally I mostly pitied the fact that our cultural inheritance lacks an old wise book giving the feeling of roots. 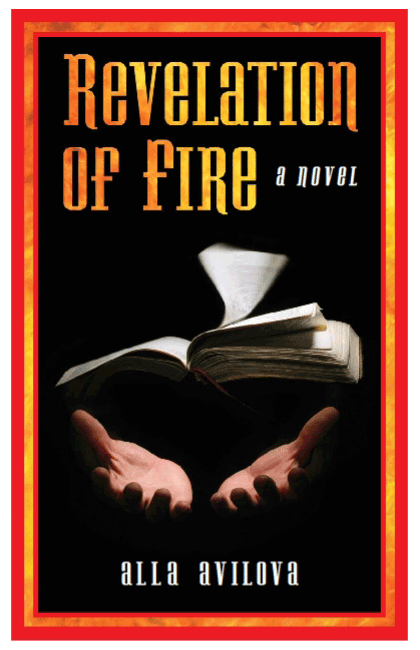 In my novel 'Revelation of Fire' I created such a book originating in an unknown 'Cenergite' order of the Russian Orthodox monks who followed Christianity in a very unusual way. This way could inspire people like myself, I mean by that the down-to-earth people who are not involved in institutionalized religion but also don't share the strict materialistic vision. And then there was the question: what would happen if such a Christian order and such a book did exist? It would be naive to imagine that the messages of these particular Russian monks succeeded in changing people more than the New Testament. I think, that the 'great revelations' themselves create considerable confusion and misunderstanding in people. It happened too with the characters of my novel who discovered Cenergite manuscript. What made the story complex is the double nature of this kind of manuscripts: from one perspective it is a message or vision, from another perspective it is an collector's item or an object with an historical value. So it became a novel which combines different elements: history, religious legend, action, love, adventure and human dramas ".